An Unlikely Friendship: An Immigration Attorney And A Border Patrol Agent How you feel about immigration can put you at odds with your friends, family or neighbors. In McAllen, Texas, two families with different points of view don't let politics come between them. Carlos Garcia plays with six-month-old Evin Wilson, with Evin's mother, Jacqui Wilson. The two are nextdoor neighbors. And they and their children often gather to play on the Garcia's slide or sit down for a tea party. It's the kind of close relationship where the kids often forget to knock when they come over to the other's house. Ben and Jacqui Wilson met as police officers in Indiana. Carlos and Elizabeth Garcia met as law students in Seattle. 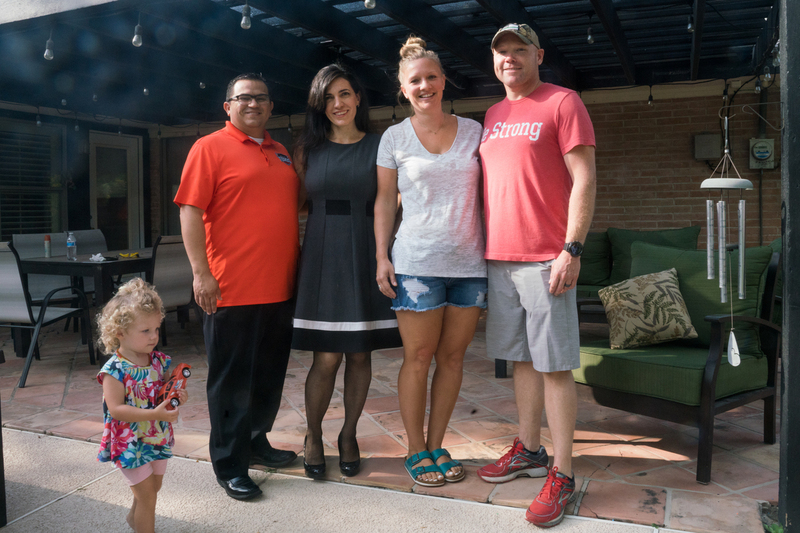 Carlos and Elizabeth Garcia (left) with Ben and Jacqui Wilson, at the Garcia's home in McAllen, Texas. The Wilson's daughter, Colby, 2, walks in the front. Ben mans a Customs and Border Protection checkpoint 70 miles from the U.S.-Mexico border. Carlos jokes that liberals like him refer to it as a "Constitution-free zone." They moved next door to each other four years ago and realized they had kids the exact same age. "Him being an immigration attorney and me being a border patrol agent is such a small part of us living next to each other that it's never even been a thought to me," Ben says. "As long as you keep an open mind and you're not so locked in that we have to be enemies because he's trying to save the people we arrest. It's not like that at all." "I would say it's more complicated than just conservative or liberal," Carlos says. "I think we have a set of values, and I think so long as we follow that, it's easy to get along with someone who works in a field that for instance others would consider that is on the opposite side of me." Spending time with them, it's fairly clear how they make it work. They don't discuss politics; they talk about their kids. They borrow the lawnmower or help fix the fence. It feels like what conversation used to be before national politics dominated everybody's social media feeds. Their wives are on different parts of the political spectrum too. Jacqui's a Republican, Elizabeth a conservative Democrat. But they say that doesn't get in the way of their bond as mothers. "We teach our children every day about respect, and I think that if we can emulate that in our lives, then certainly everyone else can," Elizabeth says. "That's the lesson we're teaching our children." Between the two families, there's a new baby and a new puppy. On a recent Tuesday morning, they're all playing together, and it's hard to tell who belongs to whom. The kids all sit down together for a breakfast of blueberry pancakes and bacon. Ben sighs and says his kids will only eat blueberries when they're at Carlos' house.